Innovation in Business, Energy, and Environment This blog collects posts and comments from students, guests, and instructors in this Harvard Business School course. A year after the infamous ‘horsemeat scandal’ the UK is in the midst of another food health scare, chickens contaminated with the food bug campylobacter. 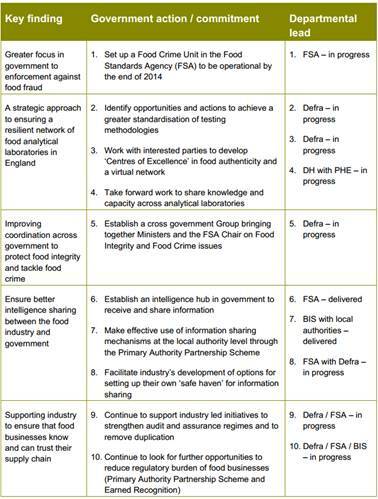 The Food Standards Agency will publish rates of contamination for each supermarket chain. The industry is bracing itself for the results to be significantly worse than those published by the FSA in August, which found six in 10 chickens were contaminated. This begs the question: did the UK learn anything from the horsemeat scandal? This goes some way to showing that the government is at least attempting to learn from the scandal. However, aside from the issue that these recommendations are long term goals (even if they were not, given the speed that the British government works at, will likely take a few years to implement.) The major failure from these recommendations is that no punishment is suggested for the perpetrators of these crimes. This is not the first scandal to have occurred in recent years. In 2002/2003 imported pig and beef proteins were found in chicken sold in the UK and in 2005 hundreds of products contaminated with Sudan 1 were recalled. In both instances, as well as with the BSE scare, prosecutions and fines were limited. This shows that the government is either not learning or not fully committed to the cause. In class we discussed who should be responsible for paying for companies within the supply chain to use products such that Identigen to trace the source of animals through the supply chain, in order to deal with issues like the horsemeat scandal. I would say that the regulators should impose legal quality controls and then use tools such as Identigen to ensure that they are enforced. A lot of the funding for the expenses incurred to do this should be done through the implementation of fines with the biggest fine going to the company that is the source of the issue and further, smaller fines for those further down the supply chain for not being vigilant on what they source and who they source from in the supply chain. This will encourage more responsible actions in the supply chain and reduce occurrences such as that with the horsemeat scandal. HBS Finance faculty interested in sustainability in the built environment including devices, structures, townships, and cities. Why I wouldn’t put my money in stocks in the clean tech space. Thanks for an interesting post on food sector events in Britain. From a personal standpoint, hearing about the contamination provides a compelling rationale for greater enforcement of standards protecting the consumer. However, I remain torn on the topic we discussed in class – namely whether the best approach is for companies like Identigen to side with government bodies in taking a punitive approach or whether Identigen should work with industry bodies in a more proactive manner. Aside from the argument raised above that the government itself appears uncommitted to the cause, there is the argument that the companies along the foodchain will be more open to working with industry bodies than complying with an intruding government body. I think this is important for a few reasons: (1) difficulty in tracking all animals within the poultry industry (due to sheer number of birds), (2) attempting ID tracking of a random selection of animals will likely not do enough to encourage practices which remove the risk of bacterial contamination, and (3) an apathetic government may not have the resources or industry knowledge to regularly visit and enforce the standards up the supply chain. There may be more potential in championing an industry body aligned with more resources (such as Identigen), that can incentivize farmers to adhere to bacteria-ridding standards by the power of endorsing poultry products to be of a particular standard. I was involved in the diligence and acquisition of a fully integrated chicken producer in Australia who had a proud record of no campylobacter. Upholding this record required a key focus on process and standard, and pride in their reputation. An industry body can assist in setting, educating and enforcing the standards required for aspiring to certification and embracing the reputational benefits that come with it.